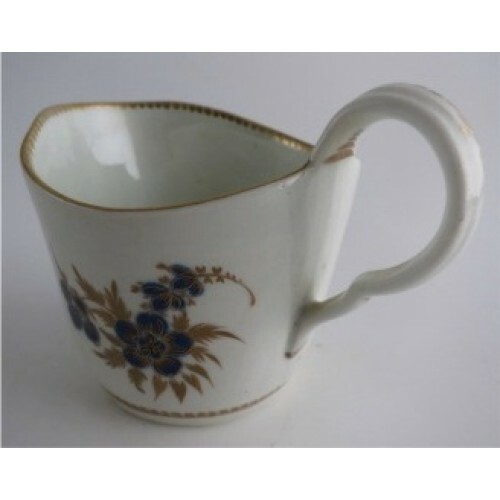 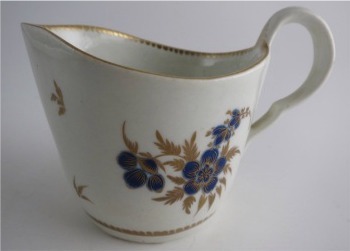 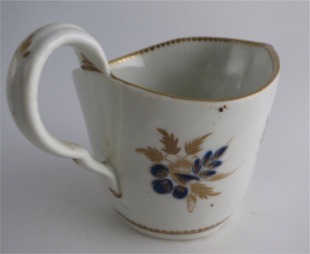 A very fine and delightful Worcester milk jug, of unusual shape and small size, dating from c1785. 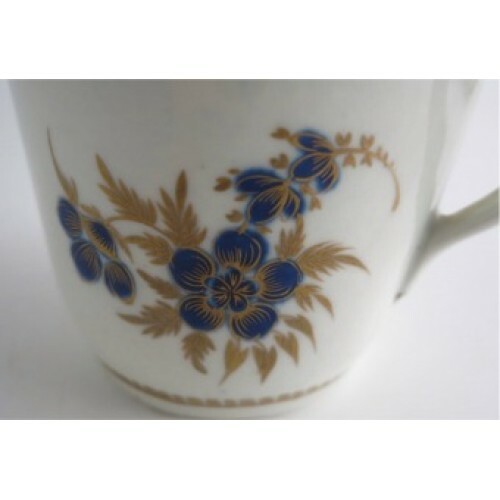 This delightful milk jug is decorated with sprays of formal flowers in blue and gold. 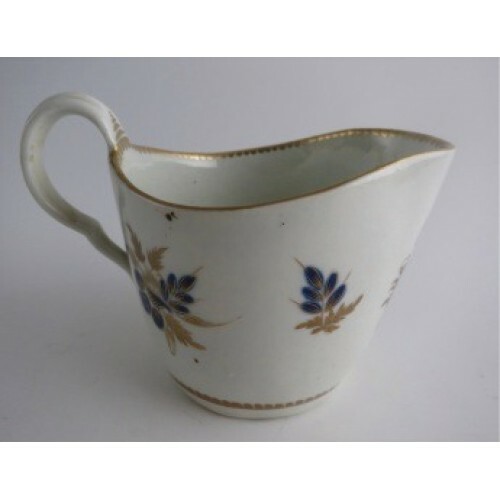 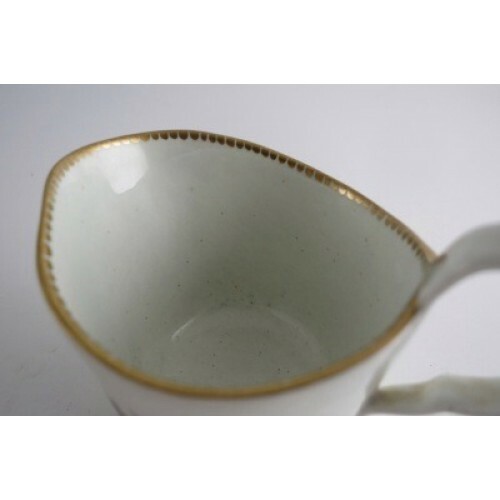 The body of the jug is of smooth soft paste porcelain of circular shape with a wide and shallow moulded pouring lip and moulded ear shaped handle. 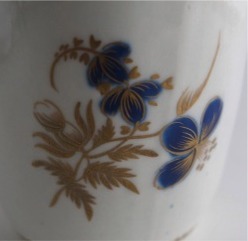 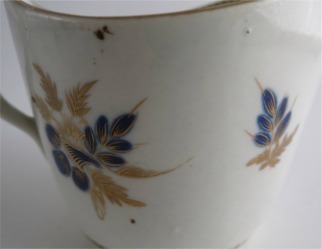 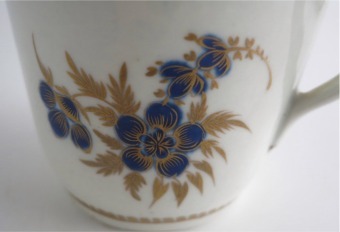 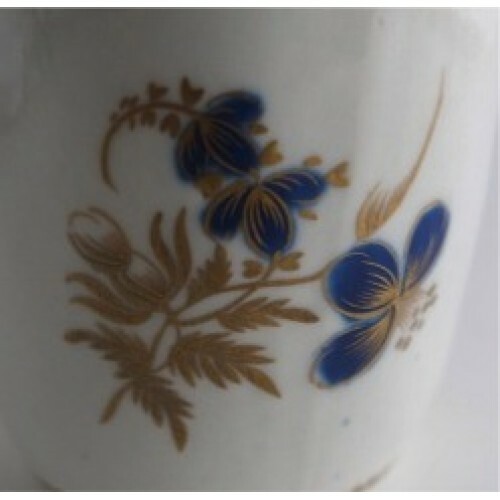 The main body of the milk jug is beautifully decorated with sprays of formal flowers of underglaze blue flowers, their stems and leaves finely drawn in rich honey gold; the fineness of the gilding is exquisite. 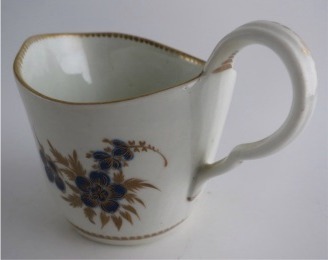 The left side of the milk jug is decorated with a main large central bouquet, formally surrounded by three lesser bouquets to the front and right side of the milk jug. 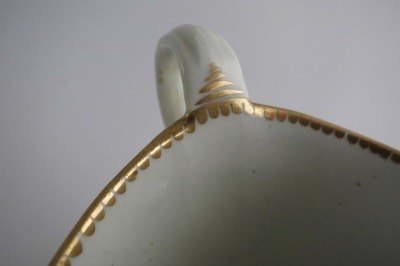 The top and inner rim are gilded, the inner rim with gilt dentil decoration. 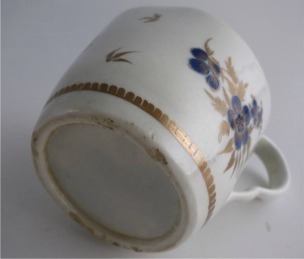 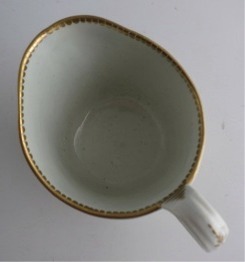 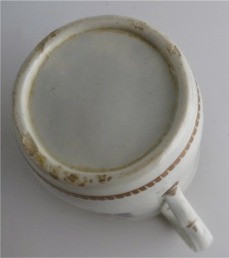 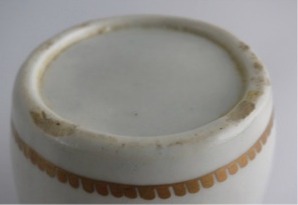 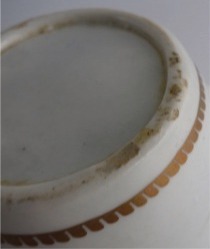 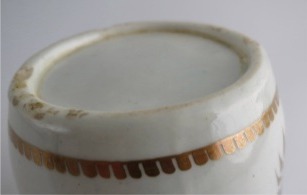 The lower body of the milk jug has a decorative gilt dentil band. 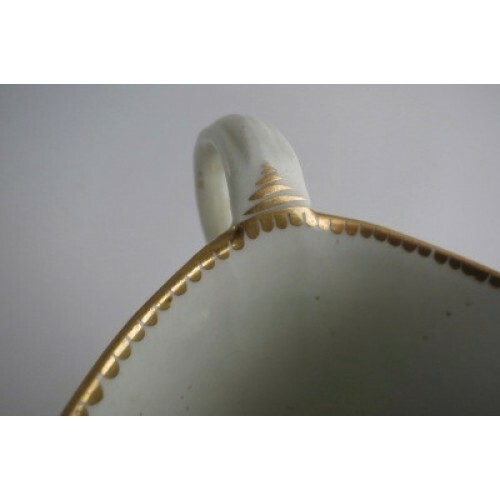 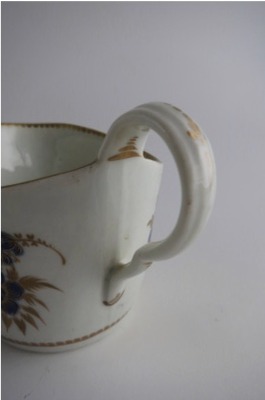 The delicately moulded ear shaped loop handle has gilt decoration applied to the back edge and to the points where it attaches to the body of the jug. 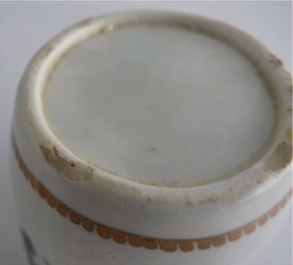 There are no manufacturer's marks on the base of the milk jug, but is from the famous Worcester factory and dates from c1785. 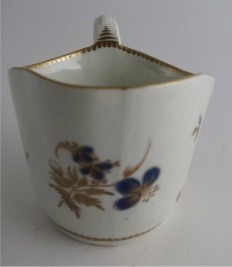 Description A very fine and delightful Worcester milk jug, of unusual shape and small size, dating from c1785. 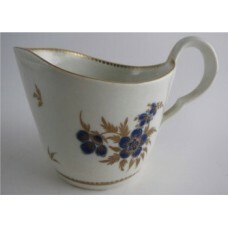 This delightful milk jug is decorated with sprays of formal flowers in blue and gold. 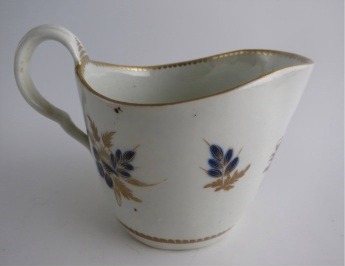 Condition (See main description for full details and pictures) The condition of this stunning little Worcester milk jug is excellent, there are no chips, cracks or restoration. 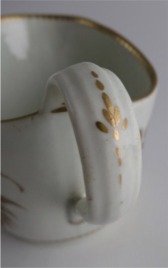 The decoration is in very good order and generally shows extremely little sign of any wear to the gilding. 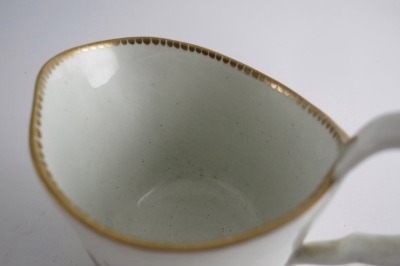 The only very minor imperfections are listed below: There are three flat chips to the very base foot rim of the milk jug and a few blotches of kiln dust stuck to the foot rim glaze. 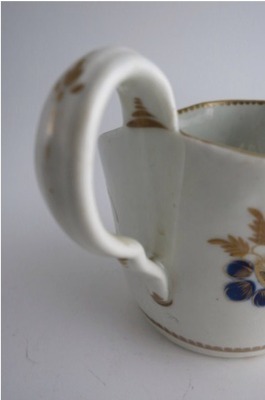 These are minor imperfections that really do not detract from the beauty of this stunning little milk jug.